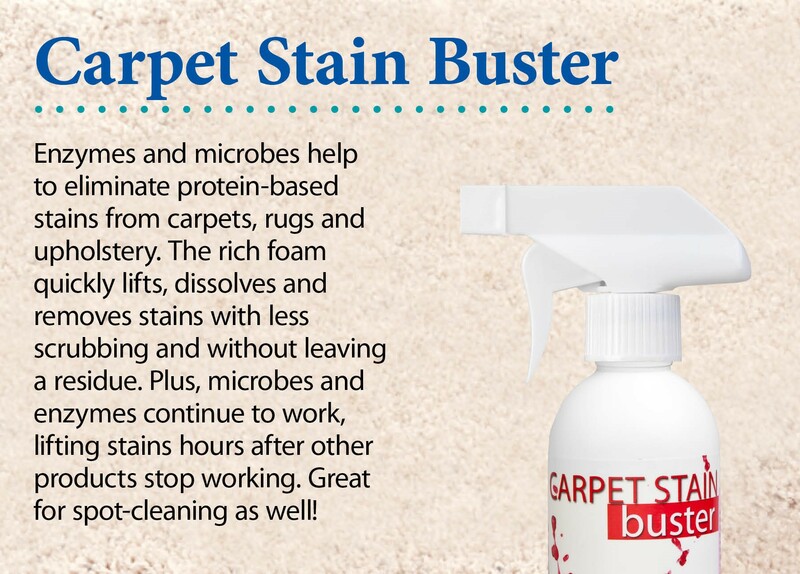 The Norwex Carpet stain buster is safe for use on all carpets, upholstery and microfibre cleaning cloths. Does not contain colour brighteners or bleach and does not leave soapy residue like standard cleaners. WHERE TO USE: Mould, mildew, blood, urine, dirt & grass. Particularly good on protein-based stains. HOW TO USE: Dilute 20% product to 80% water. Spray a little on the stain. Agitate envirocloth on the stain. Over the next few days, if the carpet buster continues to draw up the stain, agitate again with damp envirocloth. Can also be used for stain removal in laundry – use diluted as per above, spray on and leave for 10mins. Some consultants dilute to as little as 1:16 (eg 15 ml in 250ml water) for everyday use, and on the other hand for some stains you may want to try it neat (always test on an out of the way spot first!). WARNING: Always test on an inconspicuous spot first before using. See also this article for an FAQ on the Carpet Stain Buster (and a comparison to the Odour Eliminator).